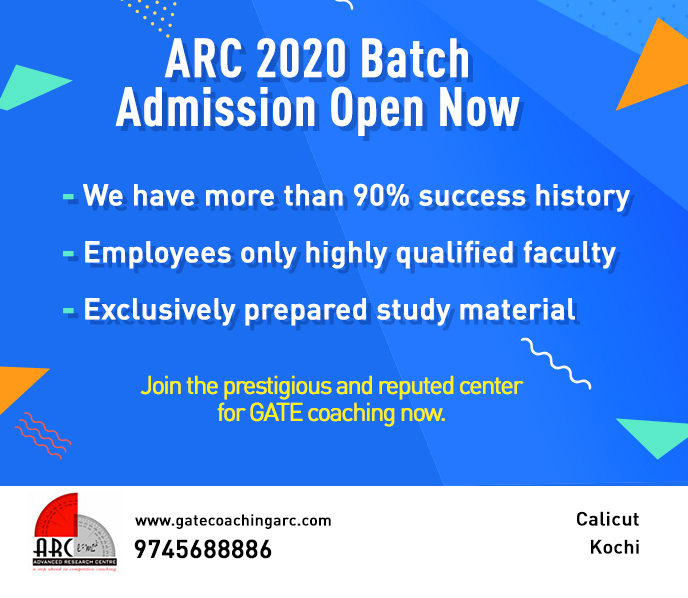 The Gate Exam also called the Graduate Aptitude Test in Engineering is one of the most competitive exams at Graduation level. It is a computer-based test which is conducted at the National level. The main aim of the GATE exam is to test the understanding of science undergraduate and various engineering students. Not only does the GATE exam score has global acceptance, but it, also offers the students acceptance in several research-oriented programs and the Public Sector Undertaking Recruitment. Through the GATE score, the students in the engineering field get a great chance to pursue the Master’s degree from renowned institutes like IIT, IISC, and other top engineering colleges. The GATE question paper for all the twenty-three branches of Engineering comprise of a single examination paper of three hours duration. The paper has total sixty-five questions, and the total maximum marks are 100. Out of these 100 marks, ten questions carry the weight of fifteen marks, and these questions are from General Aptitude. Control System Engineering is one of the famous and highest scoring subjects in the GATE, and this article aims to discuss various means that can help you prepare for control systems for GATE 2020. Candidates who have a appeared in GATE with Control Systems as one of the main subjects, have often complained about the complexity of the problems and the numerical questions. Hence, it is one of the areas that need maximum preparation for you to excel and qualify the exam with flying colors. Also check out the opportunities after GATE exam. What is Control System Engineering? Control System Engineering is a brand of Engineering that deals with the basic principles of control theory for designing a system that gives required behavior in a controlled way. In short, it is interdisciplinary. A control system engineer analyses, optimize, and outlines the complex systems that comprise of a highly complex coordination of electrical, mechanical, pneumatic, and the chemical elements. Thus, control system focuses on the design and analysis of the operation for improving the accuracy, efficiency of speed response, and the stability of the system. The two methods of a control system are modern methods and classical methods. Where the model control engineering deals with Multiple Input and Multiple Output system, the conventional control system is used in Single Input and Single Output Systems. Also check out GATE preparation tips. Why do you need to Study Control Systems for GATE? From the GATE point of view, the control systems are one of the most crucial subjects for both the Communication Engineers and the Electrical Engineers. There are plenty of exciting applications of Control System’s use in real life, which makes this topic all the more important and wonderful. All around us, we observe several systems that are operating in our lives and each of these systems can be treated as a control system, whether they are automatic or manual. For instance, our body itself is a control system about the brain that functions as a controller or the processor, and it coordinated with the various other parts, by the response it delivers. Also check out GATE self study. Hence, when you observe and notice the practical application of control system, you will be much more involved in the process and have an interest in the subject. Hence, the key here is to learn the practical applications for a better understanding of the concepts, so that when you apply those concepts in the GATE problems, the problems will interest your attention. What textbooks and reference material are recommended for control systems? This is one of the best-selling books that give great insight into the control system. The applications are solved with an accessible approach. The author, Kuo, has integrated several world and real applications throughout the design and analysis questions. It is easy to follow demonstration of the complex problem solutions with the help of computer software. The best way is to solve the previous year papers on EE/ECE/IN. Not only do the last question year help a candidate estimate the level of preparation they need but also help them grasp the type of problem that has been asked more frequently. Get previous year paper of ESE-you can download these previous five-year papers from the web. Solve the control system problems asked in the last five years and get a grasp of what you need to study for the exam. If you want to solve more problems and develop your conceptual knowledge of control systems, R.K Kanodia’s MCQ books for GATE Electronics and Communications should be the ultimate choice. This is one of the excellent books for GATE preparation as it comprises of the solutions of previous years problems. The MCQ books are available in ten volumes, and volume covers individual topics in depth. Also check out the educational apps for learning. What do you need to Study to Excel Control Systems problems in GATE? This is one of the common and the most asked topic where the candidate needs to learn about the application of Block Diagram reduction technique and the concept of Simple equivalent transfer functions during both the negative and the positive feedback. Though this topic is necessary, it still makes the foundation of many advanced topics. Make sure you study the Mason’s Gain Formula, the Signal Flow Graphs since every year there is one question form the SFG or MGF. Here is another topic introduced recently in the GATE. Under the Mathematical Model of the Control Systems, the applicant needs to study the modeling of the mechanical system. The questions are based on the drawing of equivalent electrical circuits, so a good understanding of automatic system circuits is essential. You also need to learn nodal diagram and also derive the differential equations for the Mathematical Model of the Control Systems. Time domain analysis has a straightforward approach. It is formula based as it requires the candidate to learn various method based on the time domain parameters, for example, the Maximum Overshoot, Rise Time, Peak Time, Settling time, and other error coefficients like Velocity Error Coefficient, and the Acceleration error Coefficient. Stability is another easy-to-follow and straightforward topic which requires the study of only one concept: the Routh Stability Criterion. The previous year, there was one question based on the individual cases on Routh Stability Criterion, so it is advisable to have an understanding of the general stability and unusual circumstances as well. Here, the applicant needs to understand and apply the concept of drawing root-locus and also study the general properties associated with it. For example, you must consider the angles of asymptotes, number of asymptotes, break-in and breakaway points, and the centroid. The main point to remember here is the differentiation in the root-locus properties, and also grasp where you need to apply the negative feedback and where to put the positive feedback. From the last five years, one question is being asked from this topic, consistently. This topic requires learning of small formulas like the Resonant peak, Resonant Frequency, and the Bandwidth. Apart from that, you need to know the Nyquist Criterion and the Nyquist Plots, and how they vary once zeroes and poles are added. You should learn to draw the Nyquist plots so that it becomes easy to grasp the stability of the system. Also, practice the Gain and Phase Margin and Bode Plots. State-Space Analysis follows the concepts similar to Algebras but the student needs to have an understanding of Signal Flow Graph, Differential Equation, Transfer Function using the Jordan Canonical Form, Observable Canonical form, Controllable Canonical Form, and Diagonal Canonical Form. You must also learn the process of State model analysis and State Transition matric. All these concepts are essential to judge the various aspects of the control system. You can expect a question from state-space analysis every year. To apply the concept of compensators and controller, you need to learn the condition for electrical circuit implementation of Lead and Lag Compensators, and the Maximum phase shift for Lead and Lag Compensators. You must study about the controllers like Integral, Proportional, and Derivative Controllers, and also review their combination such as PI and the PD controllers. Over the last few decades, the weight of this subject alone has been around eight to ten marks, which is pretty consistent as it surpasses several core subjects within both the branches of Engineering. A candidate who masters this subject alone can guarantee scoring ten marks out of 100. Though the questions that appear in the GATE exam from this topic is that they are not based on the direct question of theory concept, instead the application of the concepts itself. Hence, when you are preparing for the Control Systems, the main focus should be on learning to apply the questions and solving the maximum of the numerical problems.